I wish to thank Richard Cooke for allowing me to use a beautiful photograph of two P51s as the basis for the airplane above. His e-mail is richard@richard-cooke.com. He is a fellow painter. The particular airplane shown here belongs to a member of Pink Floyd and the photograph used was taken for a Shmirnoff ad that was never created. Many aircraft besides the P40 Flying Tigers have used the sharks mouth and teeth and the black and white markings onr the wings were used to better identify the aircraft belonging to the allies invading Europe in 1944. 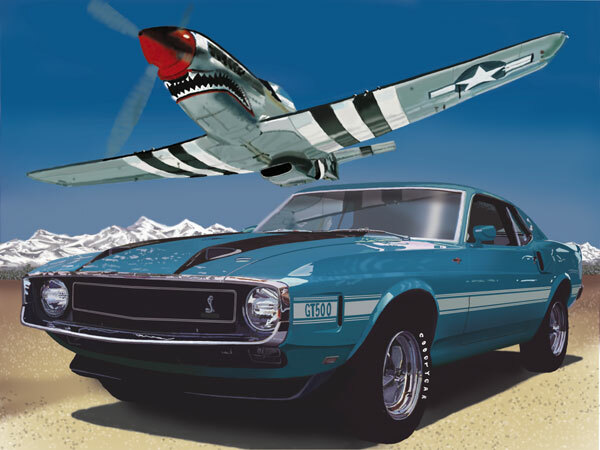 The North American P51 Mustang and the 1970 Shelby GT500 were hard to beat.